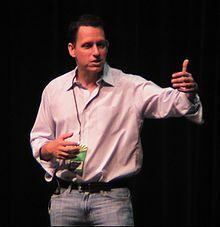 Facebook Investor Peter Thiel: Today's New Definition of Integrity? Facebook Investor Peter Thiel: Today’s New Definition of Integrity? (Note: Two weeks ago I unleashed a firebrand of controversy by talking about the integrity of the U.S. budget. Publicly we had a spicy debate, while privately I had a number of clients attack me. I was called Liberal, Tea Party Member and Conservative all from the same article! In case you missed it, last week Peter Thiel, a Director of Facebook, cashed out nearly all of his shares as soon as he was allowed to and became a billionaire. There was shock in the investment community, that a Director would cash out all of his shares on the first day he could. Doing so sends a message: either the shares aren’t worth the current price and will fall farther or that the economy is weaker than being admitted to publicly. Thiel’s personal fortune is no longer dependent on his ability to grow Facebook as one of its Directors. Common practice is that when the lock out period ends initial investors like Thiel continue to hold a substantial percentage of their shares. By doing so they send a message to other investors that they stand behind the company. We live in an age where we’ve bent the definition of integrity to fit the definition of selfishness. Unfortunately, we are paying the price for this. Desire for achievement is man’s highest purpose (and a key characteristic of top sales performers). Greed is desire for achievement run wild and is not good. We as businesspeople must demand integrity of ourselves and our teams. In this way the society in which we live — and base the future of our children — will be one we will be proud of.